Last Saturday, I went with my friend Ernie to visit Lily Dale, NY, a community of mediums and energy healers in New York, about 2 hours' drive from home. I found lots to learn from the experience, and I am glad to share it with you here. Before we went, we decided to book a couple of appointments for a reading with one of the mediums there. Not knowing who to choose, we looked through the list on the website and clicked on various websites that some of the mediums have. It was a hard choice and Ernie emailed me his top choices, then I made some choices, and we decided on one and called her. She had two appointments available late in the day, so I booked the earlier one. Then Ernie called her and booked the one after mine. I didn't want to get home too late, and so after thinking it over, I called Ernie and asked him if he thought we might cancel the later appointment and take our chances finding a different medium who has an appointment earlier in the day so we could get back at a reasonable hour. Plus I thought it would be cool if we could experience readings from two different people. Ernie agreed and canceled the later appointment. I tried calling another medium on the list of our choices but she didn't return my call. We decided to take our chances and that the Universe would sort it out once we got there. We went. To our surprise, the Sci Fi Channel was there with the Ghost Hunters and so the city was packed with people. As we walked up and down the streets looking at quaint houses next to rundown houses with for rent signs, we looked for anyone with an open appointment. There was nothing available. I started getting anxious. I started beating myself up, saying that I never should have canceled that appointment, that we went all that way there and I wouldn't get a reading (since canceling the appointment was my idea I wanted Ernie to have the reading that was scheduled), and Ernie tried to keep up with my stream of words with reassurance and telling me to stop worrying. I started worrying that I couldn't follow my intuition, that how was I supposed to know what to do, that I didn't know what guidance to follow - should I have selected this medium? Should I have made the appointment? Should I have canceled it? Should I be looking for some other signs? It was pretty frustrating. Ernie told me to relax. I was on a tangent of doubt. I went to the bathroom. While Ernie waited for me to get out of the bathroom, a random person walked up to him and said that right outside the gates, a little way down the road, there was a Fellowship Hall where student mediums and some of the mediums from Lily Dale were giving 10 minute readings for $10 as a fundraiser for their medium training program. Ernie told me this when I got out of the bathroom. He said "Here's the sign you wanted." I was encouraged. Ernie and I ate the lunches we had packed together at a picnic table. We talked about our lives and talked about our dreams. Before we decided to walk up to the Fellowship Hall, we went to Inspiration Stump, where people gather and mediums come before the crowd and select people there to give messages to. It was packed, and we stood in the back. The weather was gorgeous and the sunlight was perfectly streaming through the trees. A medium was introduced and got up in front of the crowd. She gave some names of departed people and asked if anyone recognized the names and some characteristics she named. Someone did. She gave a message of encouragement to that person and thanked everyone. Ernie and I stayed for a few more mediums doing their thing. One guy was pretty specific and told one person that she would be moving to New York and meet a friend there who she should not marry, but should remain friends with him. Another medium came up and had a strong presence, getting the crowd to say "Good Afternoon" to her very assertively. She was fun to watch. Her name was Jessie. Jessie did a similar thing to the other medium, and passed a message to someone in the crowd that her mother was watching and cautioning her not to take on too much, not to say yes to every request that comes her way. Ernie and I decided to go walk to the Fellowship Hall, so we left at that point. When we got to Fellowship Hall, we each bought a ticket for a 10 minute reading. Then we were instructed to wait until the hostess seated us with one who was available. Medium students and certified mediums were seated in rows of chairs facing people they were talking with in the big room. We sat at a table and chatted, and Ernie reminded me to just be in the moment and stop regretting having canceled that other reading. I was called to sit with a medium, and to my surprise it was Jessie from the Inspiration Stump. She is one of the certified mediums of Lily Dale. Jessie said a brief nondenominational prayer and then told me that a gentleman in very old fashioned clothing was standing with her, an ancestor of mine, looking as he had in a picture. I couldn't think of who it might be, but was ok with that. She said that lots of forward movement was happening for me, and it was important for me to stay organized and delegate when I needed help. I thanked her for this advice. She also said that my husband would find a job in two weeks to two months' time, and he would feel much lighter and happier about that. I thanked her for this also. She also said that I need to remember to laugh often and keep my creativity and sense of humor going daily, and meditate daily to hear my guidance. I know that all of these are important. I liked the reading. I thought it was great that I got a reading, and that it was less money than I had been prepared to spend (always a good thing!). Ernie had his reading, and he liked it also. When we walked outside, there was a little craft and gem fair outside so we walked through it and each purchased a healing stone and chatted with the vendors. Then we walked back to Lily Dale for Ernie to have his reading with the medium we had scheduled with. You probably noticed that I have not mentioned her name. There is a reason for this. You'll understand why in a minute. So we found the little house of our person, and we went in. I saw that she had not filled the appointment in the space we had canceled, right after Ernie's appointment. So when she came out, I asked her if she could read for both of us as originally planned. She said she could, and I was glad. I had a moment when I was again feeling unsure if this was the right thing or not, since we had made, canceled, and then I had had another reading. Should I ask or let it be? I knew that I had spent the whole day so far doubting myself and wondering what I should be doing - an uncomfortable feeling, and then I also knew that despite my spinning thoughts, I had so far received exactly what I had wanted. Funny. In any case, the medium said I should go first and she took me into her room. She put on a tape recorder to record the session and said a brief prayer like Jessie had done. Then she asked me about if my grandparents were living and I told her that one is. She said my grandparents on my dad's side were with us. I never met them because they died when my dad was an adolescent. She said that my grandmother was referring to a bracelet of some kind, and did I find that familiar? I did not. She said that it was silver and had a charm dangling from it. I still had no idea - I don't have anything like that. She said no matter, it might be something I would find and buy in the future. She then said that my grandparents I had never met wanted to tell me they love me and that they would like to be remembered. Ok. Then she asked me about my mom's parents. I told her that my grandfather had passed over. She asked if he died when I was young and I said no, it was 6 years ago. She said he was mentioning two children, did I have two children? I said I have four. She said he only knew my two oldest? I said he was particularly attached to my son (#3), who was a baby when he died. She said hm he isn't referring to that one. Then she talked about my kids and their personalities, but the qualities seemed to be matched to the wrong kids. I gently interrupted and asked her about my career and if she could get any guidance for me on my career path or my home life in the near future. She asked me what I do. I told her I teach Reiki. She said this isn't going to be my job, that there are LOTS of Reiki teachers out there and it isn't a lucrative career. She looked at my necklace and asked me if I make jewelry. I said I was going to be soon offering energy-charged stones on a necklace, and she said I should do that - make jewelry - because that would be a better business for me than teaching Reiki. I said that it is my life and my heart to teach Reiki, and I dearly want to be doing this. She said it's always my choice to do this but she sees of all the possibilities for me out there, this one has a very remote chance of success. But if I'm bound and determined to succeed, I might be able to do that. Maybe. I was upset. My time was up. I paid her and held back tears as I went into the waiting room. She called Ernie in for his reading. I spent the next half hour alone in her waiting room, beating myself up again and fuming about this reading, which I hated. I wanted to throw the tape she gave me in the nearest trash can. I knew I shouldn't have had this reading, that I should have been happy with the gift the Universe had given to me of a good reading for less money than I had anticipated, and we would have been able to leave earlier, which I had wanted. I questioned my intuition, and asked why I could only see things in hindsight, as what I SHOULD have done, instead of feeling confident about what decisions I'm making in the moment. I wondered if I should ask for my money back from the reading, which had only upset me. I know I need to be teaching Reiki, that this is what makes me truly happy, and that this gift of being able to help people learn and offer healing energy is something that I need to share. I decided to only tell the medium how I felt and give her back the tape, which I really did not want to keep. When she came out with Ernie, she started to say goodbye to us and I said that I wanted to return the tape, that I felt the reading really didn't resonate with me and I was sorry. She grew immediately angry and said that she knew she had a strong connection, and she nearly threw my money back into my hands, took the tape, and slammed the door. I stood there holding my money, and Ernie looked at me rather stunned at what had just happened. We left. Intuition may not always be there to tell you what to do at any given moment of the day. Maybe the point is to just make a decision and go with it, being open to what happens next and trusting that it is all as it should be. Worrying about what to do next takes a lot of fun out of the experience, which is happening anyway. That in itself is a powerful lesson. It's likely the most important lesson of the day and one I will try to remember and apply daily. 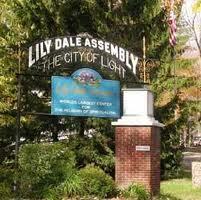 So in retrospect, I learned lots from my trip to Lily Dale. Maybe I'll visit again sometime. If so, I will go with an appointment with a medium already set (and choose from a more informed perspective). A note: I did not mention the medium's name because I know that her readings might be great for other people, so my experience should not taint her future business in any way. Even though I think she was not at her best in the way she responded to me at the end, I know that we are not all at our best, and don't want to cause her to lose business by giving her a bad review and sharing her name. Oh, and I invite you all to my next Reiki Talk broadcast on blogtalk radio on Sunday, August 1, from 10-11 pm EST, where I am excited to be featuring my friends and colleagues Ming and Candy of reikifurbabies.com to talk about Reiki for pets. If you can't make the show live, a replay will be available for download or online playback immediately after the show. 1) Read and leave a comment here about Sharon's article. 2) Read and leave a comment on Sharon's blog about my article. Those who have commented on both blogs by Friday, July 16 will be entered in a drawing to win one of the three books. I'll announce the winners on Friday afternoon! A bonus is that everyone who comments on Sharon's blog is also entered to win a basket of books! It's a double win opportunity! I'm so happy to have the chance to feature a really wonderful author, and reward my readers too! Enjoy Sharon's post! Strength, force vigor and power producing an effect. It may be mechanical, electrical, thermal, chemical, life force or spiritual energy. It is the synergist for all living things and systems to operate. Energy is manifested in many forms: motion, light, heat, ionizing radiation or sound. Nothing would be happening within us or on our planet without energy. My recent Reiki Master Student, Colleen D, is an automotive engineer. What really got my attention was that Colleen seemed so comfortable with energy medicine concepts: no struggle to prove ideals or science. After my initial surprise, I decided to interview her for this month's newsletter. I began by asking what drew her to Reiki. She said it was her late father, a magistrate and lifelong seeker of esoteric truths, who encouraged her whole interest in Reiki and related therapies. "Dad received Reiki treatments himself and was an enthusiastic fan of Dr. Robert Becker, author of, "The Body Electric." She began her early journey learning Eastern views of stress reduction and self healing. She later experienced a Reiki session and soon completed all the Reiki levels. Colleen also stated, like many, she was sensitive to antibiotics and since she suffered from chronic bronchitis, had to look outside the box for treatment. I asked Colleen about parallels between Reiki and engineering theories. Familiar words to both are blueprint, electrical, stress, design, systems, vibration, energy. Colleen stated that both Reiki and engineering share a common thread regarding vibrational theory and its application here on earth. the earth itself has several rather slow frequencies between 6 and 50 cycles (or hertz) per seconds called Schumann's Resonance. As I researched this data further, I found an interesting tidbit-the average earth frequency is 7-10 hz. which corresponds to the average frequency of our brain waves. She added, everything on the earth has its own resonance-water, trees, rocks, lowland and highlands. Thought and light are among the highest forms of vibration and light itself contains multiple vibrations. Per Wikipedia, the physics, the term light sometimes refers to electromagnetic radiation of any wavelength, weather visible or not. You as light workers are manipulating and channeling this highest form of "light" resonance. Human hands frequencies have been measured from .3-30 hz. and this changes according to the need of the client as the treatment progresses. "Also, we recognize open and closed energy systems in engineering," Colleen explained further. "Thermodynamics' 1st law is the 'conversation of energy' - the total amount of energy in a closed system remains constant and can only change form, it cannot be destroyed. I think of this form as I do self Reiki. I circulate my own chi via my hands, moving out toxin and stress of the day. Also, in engineering, we deal with open systems, where something constantly interacts with the environment moving in energy from its surroundings for maximum functioning. For example consider a car engine, with its inlet and outlet, as an open system. Air and fuel are ingested through the inlet into a chamber in the engine. Within the engine system, there is a spark plug where the air and fuel mixture ignites, to create a powerful explosion, which increases the size of the engine chamber. After the explosion, the engine rids itself of non combustible waste through the outlet or exhaust. As we give a Reiki treatment in open system fashion we also interact with the environment to move chi into the client. The healers are also the properly timed spark plug which ignites power and maximizes the flow to help the client run efficiently, expelling waste or toxin through human outlets. Another engineering view is that electrical systems automatically have a magnetic field which is also widely recognized in Reiki. Whether human or machine, electrical fields exist even when there is no current flowing. If current flows the strength of the magnetic field will vary but the electrical field strength will remain constant."